Match brick and mortar in two buildings built 56 years apart and with different weathering in the front and rear of the buildings. Meet historic commission requirements. Replace lintels that were anchored into the building with steel. 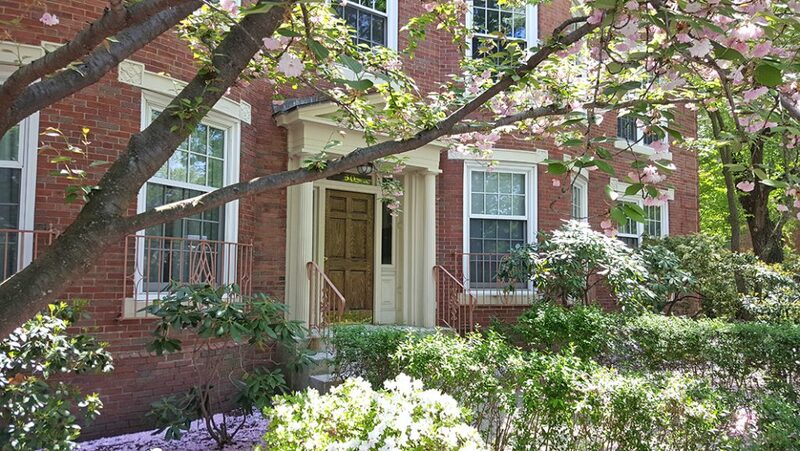 While 30 Dean Road was built in 1927 and 149 Beaconsfield Road was built in 1984, the two buildings join together, wrapping around a tranquil courtyard that contrasts with the busy intersection that abuts the buildings in Brookline. Both structures are composed of brick, wood and steel, but the 30 Dean Road building is solid, load-bearing brick, while the newer building is brick veneer. Masonry between the tops of windows and the roof on the Dean Road side needed to be repointed, as did areas between lintels and sills in the rear of 30 Dean Road. Not only were brick and mortar different on the two buildings, but it had weathered differently in the front of the buildings than it had in the rear. The older building has two curved bay fronts featuring cast-stone flat arch lintels with steel angle backup on the second and third floors. The first floor features cast-stone lintels with floral medallions and iron French balconies at the windows. Reinforcing steel in the cast-stone lintels had corroded and expanded to many times its original size, damaging the cast stone. Use of hollow steel pipes embedded in the lintels enabled corrosion to travel the entire length of the lintels. Previous repairs had been “ineffective” due to improper preparation and repair materials, according to Edward Moll, principal of Structures North Consulting Engineers, Inc. In the most severe cases, “rust jacking” took place. When steel corrodes, it expands to many times its original size and lifts the masonry at the jambs. It also either lifts the cast-stone lintel above it or depresses the steel lintel downward. The severely damaged lintels had to be replaced with new galvanized steel lintels and custom-fabricated precast-stone lintels. Where corrosion was moderate, lintels were protected with high-performance coatings. The length and profile of the custom-fabricated lintels had to be “just right,” Moll said, as did the accompanying ornamentation, which features a raised keystone. A brick cornice in front of the building had also deteriorated. On the Beaconsfield Road walls, concrete flat arches were built without steel lintels. As the masonry façade expands and contracts, the flat-arch lintels act as a wedge and drop down a small amount, causing the mortar that surrounds the concrete lintels to crack. The cracks allow water to seep in, which causes further damage as it freezes and thaws. Perimeters of concrete lintels on the 149 Beaconsfield Road side of the building had to be cut out and refitted with backer rod and sealant to prevent water filtration and allow some movement of the brick veneer without further damage to the mortar. 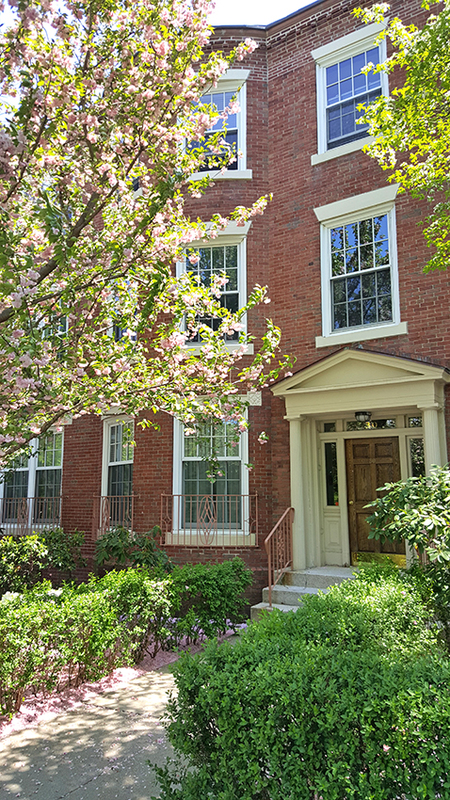 For the repointing portion of the project, Moll was especially appreciative of Statewide’s ability to match the new brick and mortar with existing brick and mortar. In spite of the project’s challenges, Statewide completed the job on time and on budget. Even more important, the job was done right. Property Manager Kirsten Bulger of the Renzi Bulger Group also gave Statewide RM high marks.